A simple yet perfectly packaged digital piano for beginners that is not only simple to use but makes learning piano even simpler for newbie! This interesting digital piano is a complete package with realistic sound effects, feel and impressive features. It offers ideal features for beginners to get their learning and piano practice grow rapidly. That is why it is termed as one of the best choices of pianos for beginners. For those aspiring musicians who want to get the best piano music out of their instrument, they must have their hands on customizable features of this digital instrument. Packed with full piano keyboard, powerful sound and realistic voices makes it an interesting full featured instrument with which pianist can experience rich and deep sound. Although there are other choices available for beginners such as Yamaha P71 and others but this piano is more affordable choice and is enriched with more features. Compact Design: The piano has a compact structure with dimensions only 50.5” x 11.5” x 3.6”. Along with that it weighs only 15.7 pounds. So you can place this piano easily anywhere and can carry it around too. 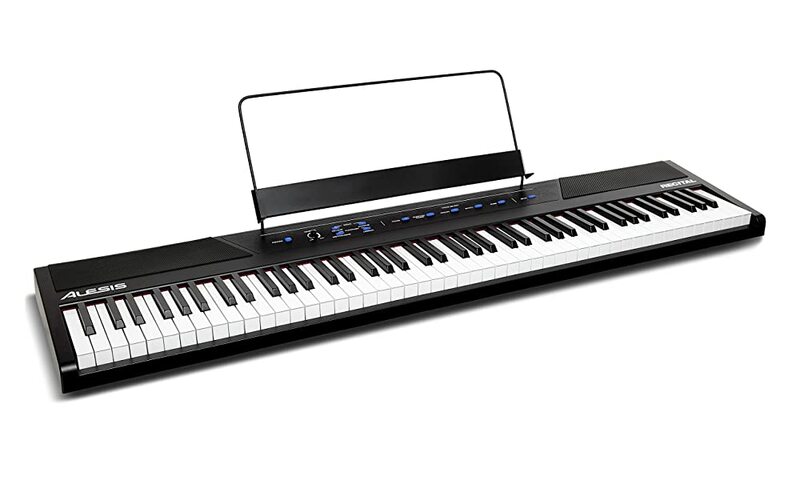 Full-sized Keyboard: This digital piano is appointed with a full sized 88 keys semi-weighted keyboard that includes adjustable sensitivity that one can fix and play piano in his own style. 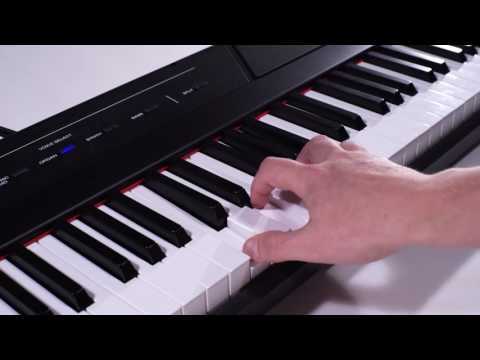 These velocity sensitive keys can be adjusted between low, medium or high sensitivity ranges giving you complete freedom of style and let a pianist feel like playing on a real piano. Premium Sound: With 5 realistic voices built-in including acoustic piano, organ, bass, synth and electric piano and 128-note maximum polyphony; a pianist can work for a complete and richer tone. Layer Mode: Even you can combine and layer two different voices at the same time in layer mode to experiment your versatility and creativity within your musical piece. Split Mode: With split mode, you can have two different voices for each sides of the keyboard i.e. one voice on the left half and another voice on the right half. Pianists can use this mode to use play two different voices from each of their hands on the keyboard. Presets and Demos: With this digital piano, you get 60 preset songs and 2 demos included with which you can practice and learn more. Built-in Speakers: Further sound quality is uplifted with their powerful 20 watt built-in speakers that give you a clearer and larger sound. Flexibility of Power: The Alesis Recital package comes with a power adaptor so pianist can plug in their instrument and play for all day long. But in case you forget your power adaptor or do not have a power outlet on site; it comes with battery powered flexibility. You can get this instrument running with 6 D cell batteries that makes it a mobile and flexibly running piano. Lesson Mode: This keyboard has a lesson mode where keyboard can be divided in two areas; each having similar pitch and voice so that a teacher and a student can play together. This feature further simplifies and speeds up the process of learning as teacher and students don’t have to take turns to play and learn. Skoove Compatible: Furthermore, this keyboard is Skoove compatible which is an online piano instruction service. This online service works on improving your musical skills and helps you in achieving your goals. You can just set the tempo that you wish to learn and perform. What Skoove does is that it would listen to your performance and real-time feedback will be provided. Feedback will be given with adjustable tempo settings that would match your level of piano playing skill. Not only that but this piano comes with free three months subscription of Skoove Premium so you can unlock lessons and songs to widen your learning spectrum. You get complete access to courses and along with that you can learn and practice more with new lessons included each month. Effects: You can tailor sound with adjustable effects including reverbs, chorus along with pedal resonance FX. These effects give you a chance to further polish your piano music and be more expressive and creative with music. Adjustable Built-in Metronome: Metronome can be adjusted between 30-280 beats per minute and user can set the tempo according to their own style of learning and playing at any level. USB-MIDI Connectivity: You can connect this piano to your computer system with its easy connectivity option. Headphones Output: It features a ¼” stereo headphone output that enables private and quiet practicing and performing sessions for any pianist learning or playing in any setting. Sustain Pedal Input: Moreover, you can also add mixers, synthesizers, amplifiers, recorders or any other sound system with this digital piano through its ¼” sustain pedal input. Accessories included: The Alesis Recital is packaged with 3 months premium Skoove subscription code, power adaptor, music rest, user guide, warranty and safety manual. Affordable choice for beginner pianists. Semi-weighted keys are absolutely perfect option for learners and new pianists. Full keyboard gives you real piano playing experience. Light weight and portable design. Multiple outputs connectivity makes it easier to use with other systems. Headphones connection option to give you peace of practicing along without disturbing others around you. Skoove compatibility for interactive learning. It has only few sample tones. Speakers give reasonable sound but for louder sound you would need to connect to external sound systems. This piano doesn’t include a sustain pedal. This digital piano enhances and expands your capabilities of playing piano with all the features that it has. It has everything that you need in order to experiment with piano music. All the useful sound and feel features are there and apart from those features; this piano proves to be a great learning tool for piano beginners. Built-in speakers, multiple voices/sounds and a full keyboard make it a perfect package for beginners.